Gardenias are in full bloom at the moment. 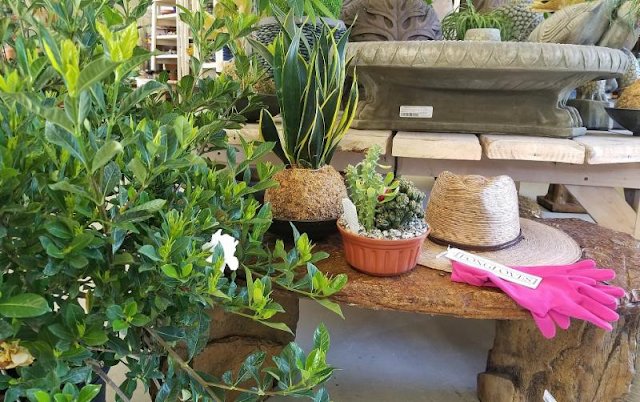 While Miami Supremes are the most popular, there are other just-as-wonderful varieties like Tahitian and Vietnamese gardenias. 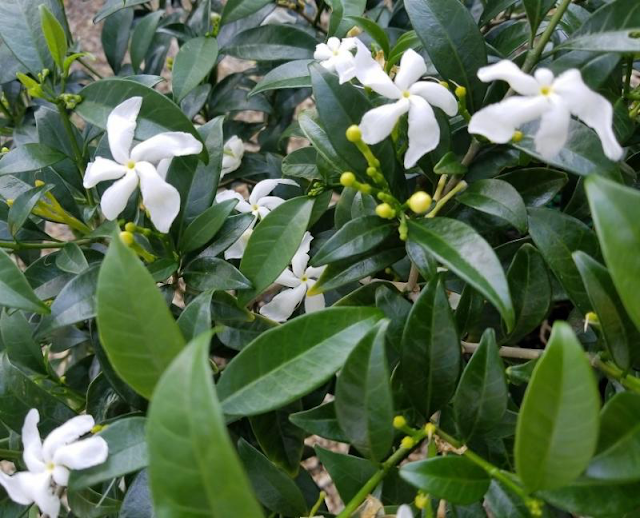 The Tahitian variety has large multi-petaled flowers that are highly fragrant. Younger plants tend to have a vining habit. Just like the Miami Supremes, it also blooms in cycles throughout the year. The Vietnamese gardenia has a flat blossom of only five petals. This spring and summer bloomer is also highly fragrant. It can reach a height of ten feet, but six feet is more the norm. Both of these sun loving gardenias appreciate additional iron once a year or a soil acidifier. Banana Bush 'Netty Dwarf' (Tabernaemontana pandacaqui) is a native of the South Pacific. It is a perennial shrub that grows only to about 6 ft. if that. Its lush green foliage is a great backdrop for the abundant and continuous small white flowers that are pinwheel shaped. The flowers are then followed by a pair of seeds that look like two bananas hanging in opposite directions, hence its common name. They start out red and then turn yellow when they ripen. Banana Bush works well as a mass planting, specimen shrub, or containerized accent piece. It is also drought tolerant once established and is a moderate grower. Our customers that have used this plant in their gardens rave about how well it does and the lack of pest problems associated with it. This plant is truly a winner. We are in the peak season for butterfly migration back to the north. 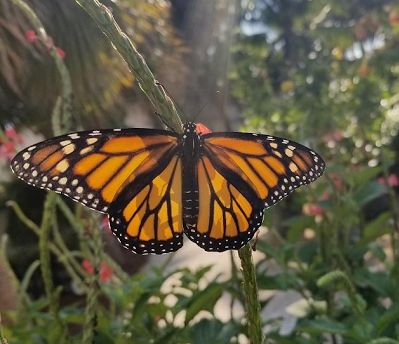 We have been visited by several species including swallowtails, julias, atalas, sulphurs, fritillaries, great southern whites, zebras, and of course monarchs. To name a few, we have a fantastic supply of butterfly attracting wildflowers, including gaillardia, rouge plant, coreopsis, blue-eyed grass, mimosa, scorpion tail, asters, blue sage, wild petunia, seaside ageratum, frog fruit, and twinflowers. All these are available in 1-gallon pots. We are thrilled at SmartyPlants by the number of our customers that include host and nectar butterfly plants in their gardens. We share in the joy of their sightings of new butterflies or the hatching of the chrysalis, which we have observed even under fountains and other hardscapes inside the building. Butterflies are truly determined and awesome creatures. We are proud to implement pest-control practices that provide a non-toxic environment for our flying friends.